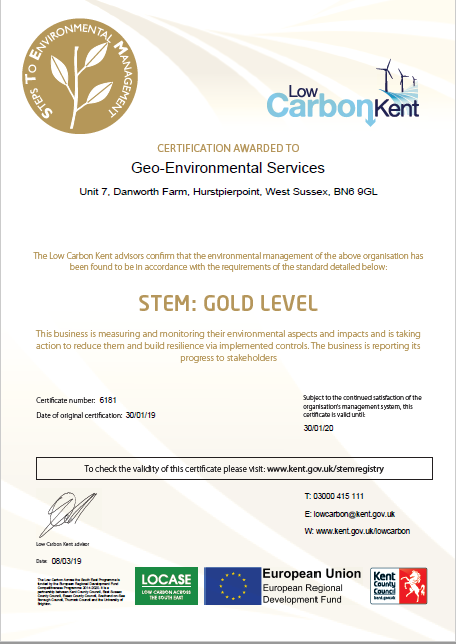 Congratulations to our Environmental Champion Anthony Potter who has managed to get the company accredited to STEM: GOLD LEVEL – STEM stands for Steps To Environmental Management. The award shows that the business is measuring and monitoring their environmental aspects and impacts and is taking action to reduce them build resilience via implemented controls. Whilst the Company already has ISO14001, Anthony has been constantly improving the environmental management of the Company. This award is a testament to his hard work and effort over the last few years. The scheme helps businesses to improve their environmental performance through a series of assessments and certificates (blue, silver and gold). These levels correspond to the 3 phases of the National Standard BS 8555. A business that has top management support for its environment programme and has carried out a baseline assessment of their current situation. A business that has measured its carbon footprint and taken action to reduce it. The business has identified the resources, legal requirements, training and communications needed for its environmental programme. A business that is measuring and monitoring its environmental impacts and has taken action to reduce them. The business has reported its progress to Low Carbon Kent and other stakeholders. the opportunities of the low carbon market.